Most commonly we are asked to meet, greet and interact with your guests and provide amazing photo opportunities. 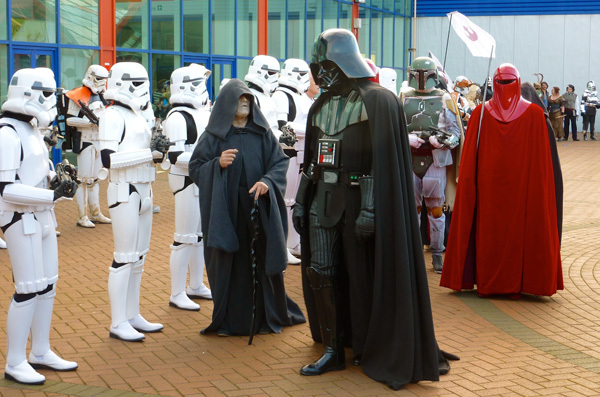 At bigger events, with a good number of costumers attending, we can organise a march along a suitable route in the venue, in the style of a parade, to showcase our costumes and provide further photo opportunities, this always goes down very well with the public. We are asked to do many things and we will try and oblige as long as it is safe, appropriate and allows us to remain in character. So for instance, we could draw tickets for a raffle, start a race, 'intimidate' guests during a charity auction or form a guard of honour but we would not dance, sing or participate in anything requiring us to not behave in an Imperial manner. Unfortunately we are not entertainers per se so, as a rule, we do not attend children's birthday parties. Please do discuss what role you would like us to play on the day with your UKG Event Organiser so the format of the day can be agreed in advance. UKG crew members (also known as spotters) will also always be in attendance at events to help out those in costume and ensure our participation in your event runs smoothly. The longer the lead-time you give us, the better chance we have to make your event special. Generally one month's notice of the event is requested. This allows enough time for your UKG Event Organiser to ensure everything is in place for us to provide our best service to you. You will need to contact us via the link below and we will need a brief description of the event, the venue, address, date, start and finish times and any ideas you have on number and type of costumers. You may request specific characters to attend and we will do our best to oblige but because our members are volunteers we cannot guarantee the required character will be available on the day so it's best to be flexible. After you have contacted us, one of our very experienced UKG Event Organisers will get in touch with you and can answer any further questions you may have & will be your point of contact going forward. At the event venue we will require a secure changing area within easy access of the main event and where the public cannot see us. Tables are very helpful as it can be difficult to bend down when in costume. We would also be grateful for some basic refreshments and for full day events some kind of lunch/snack provision if possible. 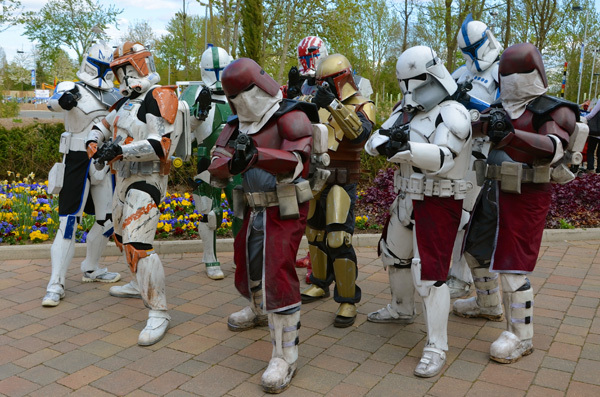 Our troopers can get very hot, tired and thirsty in their costumes and will require regular breaks to refresh. Please discuss how you would prefer the breaks to be managed to fit in with your event with your UKG Event Organiser so this can be agreed in advance. We will arrive with large suitcases containing our costumes so parking provision near the event is also appreciated if possible. 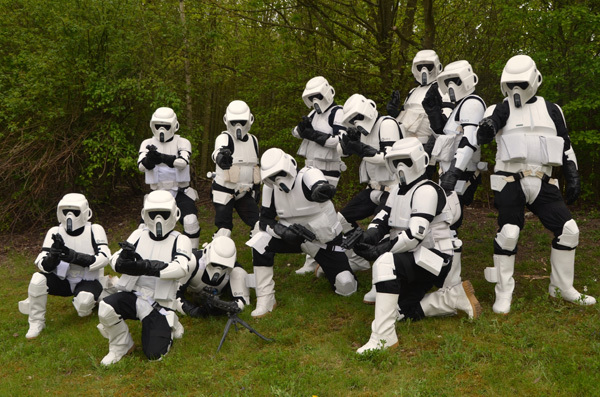 The UK Garrison, as with all other 501st Legion garrisons and outposts around the world, is entirely made up from volunteers and is a wholly not-for-profit organisation. If we are requested to attend an event that is corporate, marketing, promotional or any other type of commercial event that does not in itself benefit a charity then we ask for a donation to be made to the UK Garrison. The donation requested is calculated around the size of the event, the number of troopers attending and the length of the event. 100% of this money will then be divided amongst the various charities that the UKG supports. We make no deductions from this donation for personal expenses. If it is a non-commercial event that will benefit a charity, hospital, the community or those in need in some way then we do not ask for a donation. We will just turn up on the day and help to bring smiles to the faces of children and adults alike. What characters do you have? 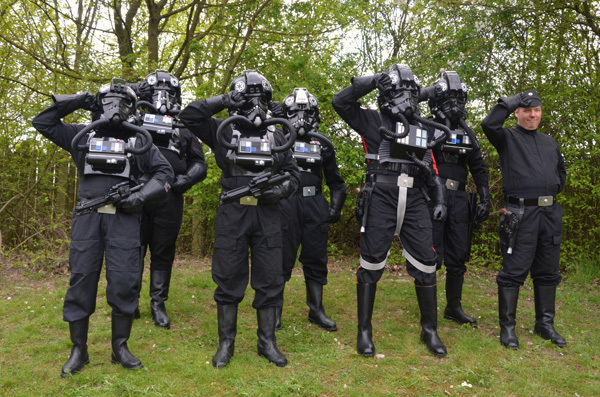 Star Wars Imperials - The 501st UK Garrison is dedicated to the 'bad guys' of the galaxy. This includes Darth Vader, Darth Maul, Stormtroopers, Sandtroopers, Biker Scouts, Boba Fett, TIE Pilots, plus many others. 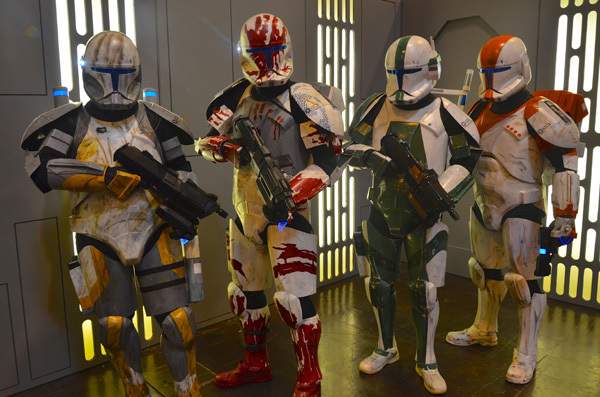 Our range of costumes is expanding all the time along with the Star Wars universe to cover the 'bad guys' from the movies, comics and animations. Star Wars Rebels - The UKG is unique within the 501st Legion in that when it first started, before becoming part of the 501st Legion, it also incorporated Rebel costumers, the 'good guys' of the Star Wars universe. If you are after the 'good guys' then the Rebel Command can provide characters such as Jedi Knights, Obi-Wan Kenobi, Princess Leia and C-3PO. Other Movie Genres – The UKG can also provide a selection of costumes from other movie genres via the Reel Icons who can help you with characters from Stargate, Battlestar Galactica, The Matrix, Doctor Who, The Stig, Lara Croft, Indiana Jones, Capt Jack Sparrow, superheroes such as Batman, Catwoman, Iron Man, Captain America and many others. School fetes and fayres etc. Over the summer of 2015 we received an extremely large number of requests to attend school fetes and fayres all over the country. Due to the school calendar these all fell over a five week period in June and July. We are all volunteers who love bringing the magic of Star Wars to people. However despite our best endeavours, we were unable to attend many of them due to the sheer number of requests we received. 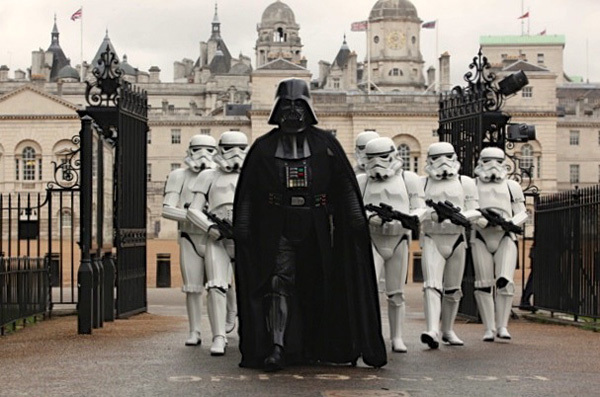 This led to disappointment not only for the schools but for the UK Garrison as well. Organisers then had to re-arrange their plans at short notice. For this we apologise. With the increased interest that the new Star Wars movie: The Force Awakens is generating, we expect even more requests in the future. Unfortunately, because of this we have sadly had to take the step that we will be unable to attend any school fetes for the foreseeable, unless they have a direct link with the UK Garrison. We have made this decision based solely on the fact that we would be unable to attend a large majority and do not want to promise attendance when we would potentially be unable to deliver. Apologies once again, thank you for your understanding and we wish you every success with your event. 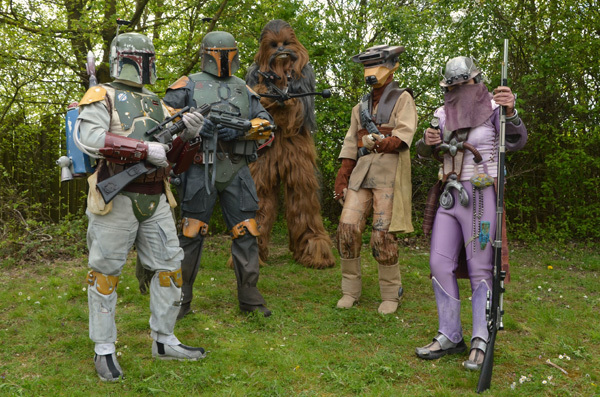 How do I request the UK Garrison to attend my event? Submit an event request and give us as much information about your event as you can. A member of our dedicated Events Team will then contact you to discuss your requirements. They can answer your questions and advise on what they would or wouldn't recommend for your event based on many years of experience. 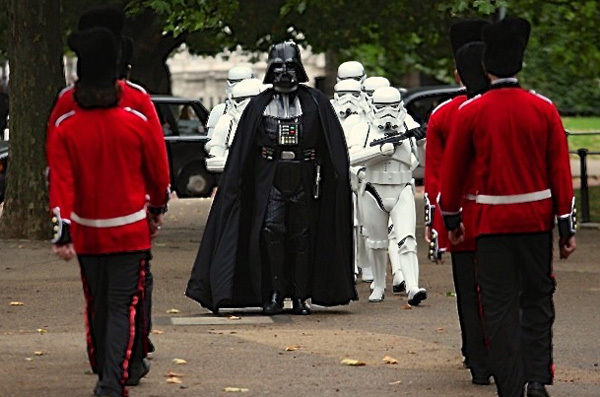 The UK Garrison carries Public Liability Insurance. Details are available upon request from our events team.